You are here: Home / Lifestyle / New Finds Galore! It’s been a long time since my last “new finds” post, and I have a lot of things to share! Both self-bought and loving and new products passed to me to review. Let’s get started! This new-to-me brand of nuts called Bobalu are actually almonds in the shell. I didn’t realize almonds were ever sold this way! Think of them as almond pistachios. 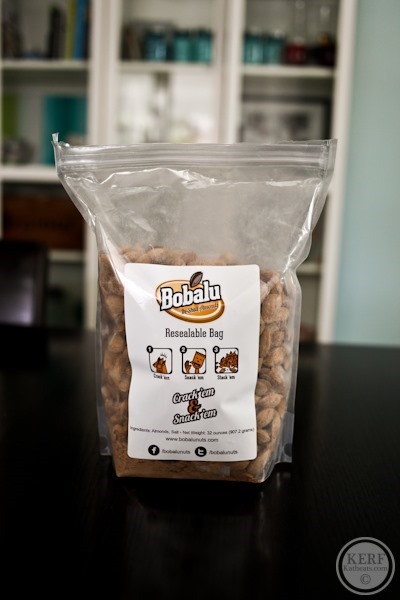 Bobalu sent me this bag to taste test, and they are roasted, salted and totally delish. They are my favorite snack lately! Have you seen this brand of savory yogurt? I found it at our Whole Foods and it looked too interesting to not take home to try. Grass fed, all-natural and low in sugar (6g for the carton – only a little added from maple sugar). 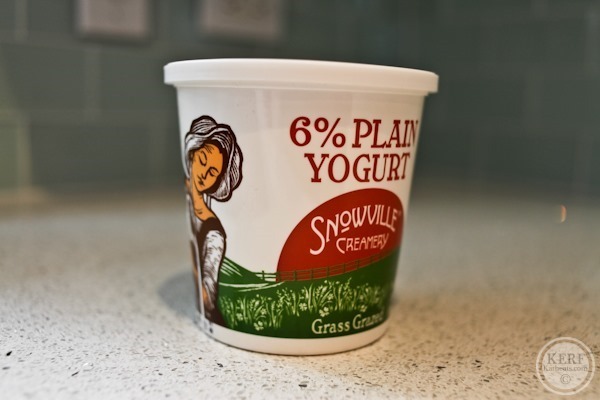 Continuing the yogurt love, I am LOVING this brand – Snowville Creamery. I also bought it at Whole Foods. It’s on the pricey side, but worth it for grass-fed milk and the thick, not-too-sour flavor. It’s kind of like the European yogurt I used to buy combined with Greek yogurt. They have some really cool flavors too, but we are a plain-lovin’ house. 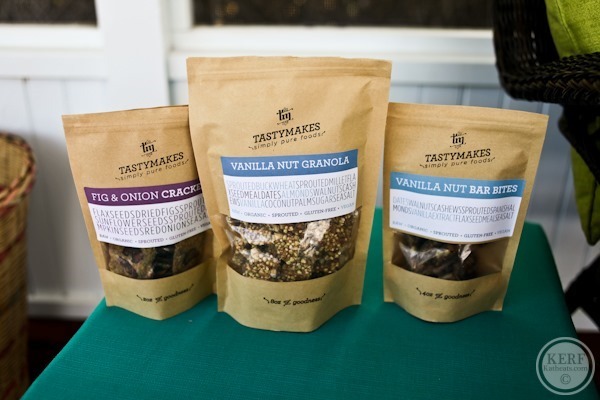 Tastymakes sent me some of their snacks to try out…. They are raw // sprouted // vegan // organic // gluten-free granola clusters, mini bar bites and crackers. I tried the Vanilla Nut Granola, the Vanilla Nut Bar Bites and the Fig Onion Crackers. 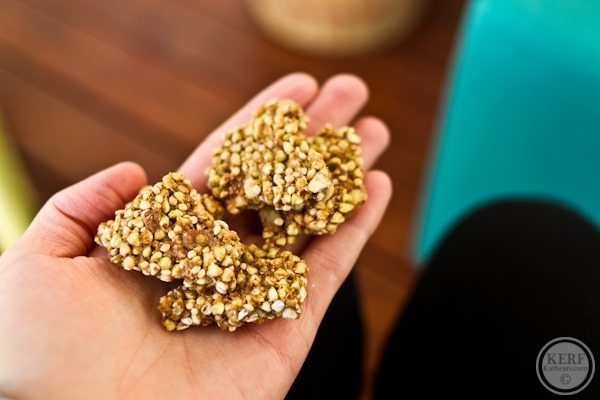 The Vanilla Nut Granola is packed with nutrition, texture and flavor in the form of Sprouted Buckwheat, Sprouted Millet, Flax Seed Meal, Dates, Sprouted Spanish Almonds, Sprouted Walnuts, Cashews, Agave, Vanilla Bean Extract, and Sea Salt. The vanilla flavor is both fragrant and flavorful. They have an earthy flavor (from the buckwheat, likely) that was balanced out with subtle sweetness – and all that vanilla! They have proved to be a great snack out of hand and a yummy yogurt topper! 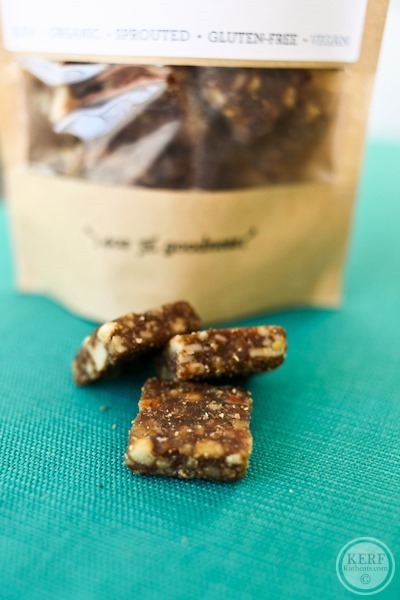 The Vanilla Nut Bar Bites are made from Dates, Sprouted Walnuts, Cashews, Sprouted Spanish Almonds, Vanilla Extract, Flax Seed Meal, and Sea Salt. No added sugar or oils! They taste a lot like a Larabar and are conveniently in bite-size pieces so you can have just a taste for a tide-me-over snack or a few to spread out over a whole afternoon. I imagine they would make great distance running snacks or pre-workout fuel. Lastly I tried the Fig Onion Crackers. 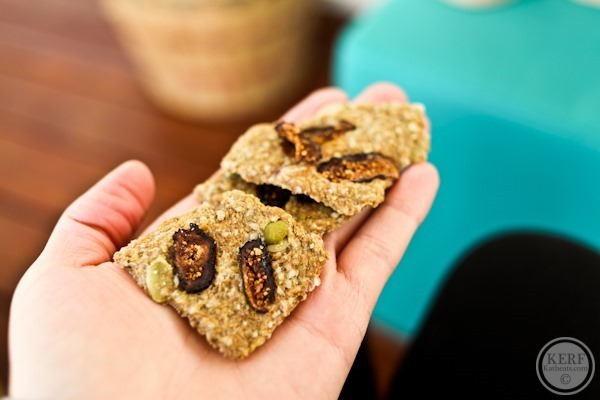 They are made from Flax Seed Meal, Dried Figs, Sprouted Sunflower Seeds, Sprouted Pumpkin Seeds, Red Onion, and Sea Salt. The onion was subtle and reminded me of French Onion dip with a sweet kick from the figs. Since I’m not the biggest onion girl, I served these to some onion-lovin’ friends and they raved about them. They’d make a great addition to a cheese plate! Just a fun find at Target I picked up, but this stuff smells SO GOOD! I look forward to dish washing every time. 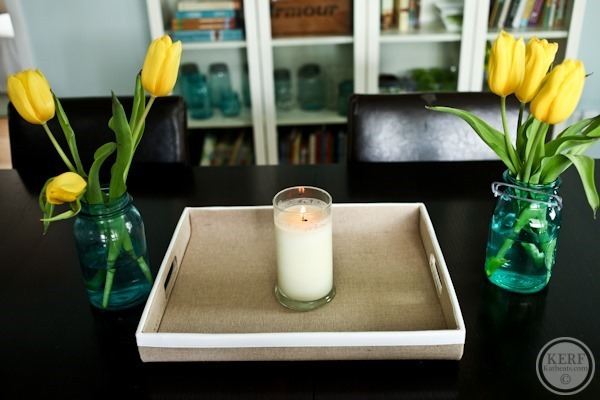 Blog reader Kristina sent me one of her Lilypad candles to try out and it’s divine!! Lilypad candles are 21 ounces, burn for 90 hours and are made from 100% all natural soy wax, which burns clean without dyes. I love that there is not black soot around the edge, and the Clean Cotton scent has made my house smell wonderfully springy. 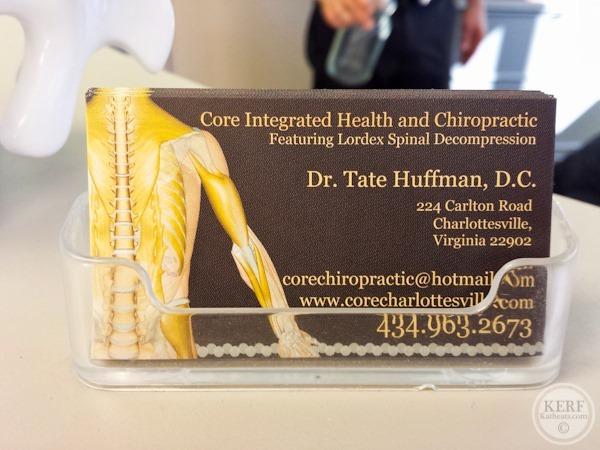 I paid a visit to friends Faith + Tate lately as I went into Core Chiropractic for a routine visit. I like going a few times a year to make sure everything is aligned. Pregnancy and motherhood baby lifting put my back through the ringer, but I’m feeling much better these days. And it’s always good to see these guys! We’re having them to dinner soon. Still with me? There’s more to share! Made just up the road from us in Virginia Beach, Ernie sent me some of his famous salsas to try out. These were not invented overnight; rather, Ernie has been perfecting and tweaking the recipes for 25 years. 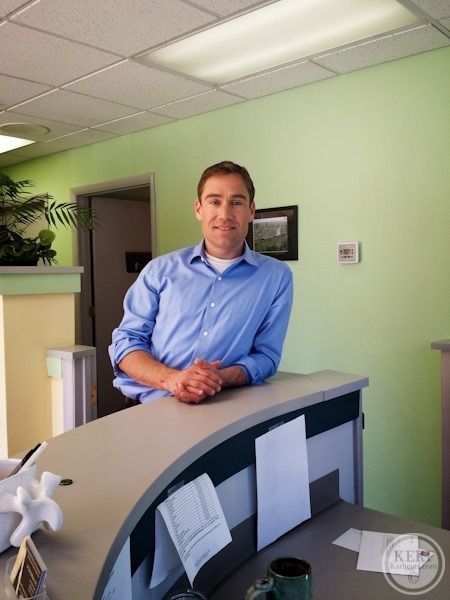 After friends and family encouraged him to start selling them, Ernie retired from his job as an investment banker at the age of 49 to start Ernie’s Epic Foods and bring his salsas to your home. 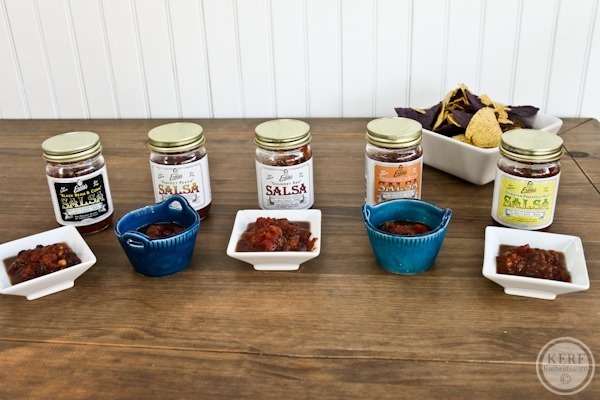 We had a salsa party over Easter and enjoyed all 5 flavors! Ernie is right when he describes these as having a garden-fresh flavor. They absolutely tasted fresher and were packed with more flavor than a classic commercial salsa. Rather than a punch of watery tomato and a flare of spice, these had layer upon layer of complexity. Just throwin’ this out there, but these shorts are SO cute! After my skincare post with the Complexion Concierge, I ramped up my skincare routine and want to share how it’s going. Based on Anna Lise’s recommendations, I went for the RESIST line by Paula’s Choice. I have been head-over-heels impressed with both the company and the products! I bought the Toner, Daily Smoothing Treatment (5% AHA), Super Antioxidant Serum, Barrier Repair Moisturizer and Weekly Resurfacing Treatment (10% AHA). I have the SPF day moisturizer coming in the mail! 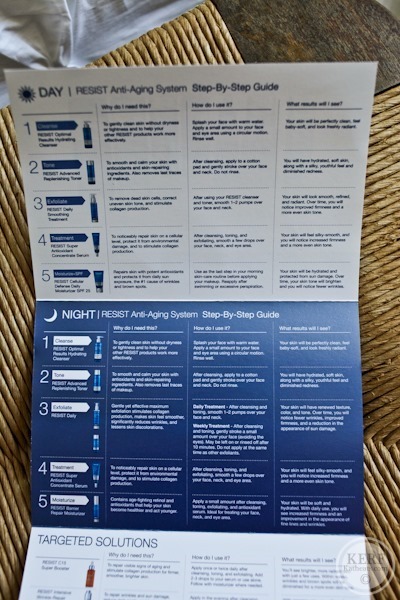 As a newbie to all of this anti-aging stuff, I love how clear the step-by-step guide is. The products came with a detailed chart answering why do I need this? // how do I use it? // what results will I see? I also bought the Ultra-Light Super Antioxidant serum for daytime use and it’s much thinner than the original – great for under make up! Paula gave me a referral link that gives YOU $10 off your first order. It was too good not to share – use it if you wish! Do you have Lock Laces on your shoes? LIFE CHANGING! I bought some after seeing them on Healthy Tipping Point and haven’t tied a shoe since. I’ve been a fan of Oh She Glows since our blogs were babies together. When I was asked to review and giveaway Angela’s new cookbook, I was super excited to get a digital copy of the book. Enter below to win a copy. USA only, please. The Oh She Glows cauli-power recipe is amazing. Big fan. 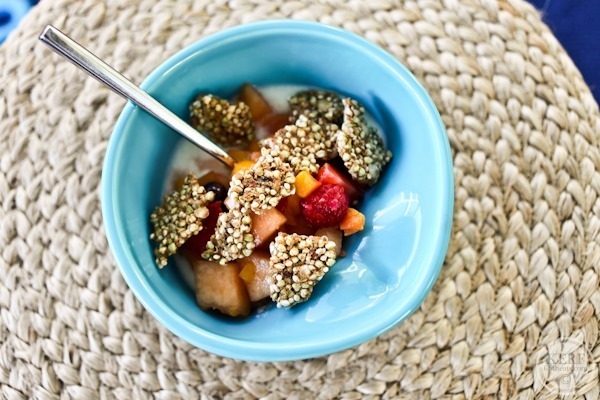 I just made some buckwheat granola the other day and it is fantastic, I will have to try the Tastymakes brand! The Blue Hill Butternut Squash Yogurt looks amazing! Can’t wait to try it! I had not realized Snowville Creamery had made it in stores outside of Ohio! We live near the farm and love their products. I used to buy the whole milk exclusively for my toddler but once she started drinking about 16 oz of milk it became too expensive when their prices were raised. Their ginger yogurt is really good…and I don’t even care for yogurt! My favorite ice cream (Jeni’s-sells online) uses all Snowville Creamery products. I third the snowville love! It’s awesome that grass-fed milk is becoming easier to find and clearly labeled! Love real food, love vegan food, love Angela! It would be awesome to win a copy of her book. I have been wanting to check out a copy of this cookbook! Even better if I can win one! Ernie’s salsa looks amaaaaazing! I’d love to try the peach flavour – I’m such a salsa fiend but I’ve never had something like that before! i adore salsa and yogurt–i am definitely on the lookout for those savory yogurts. i think i would LOVE beet! What a lot of cool new things! Tomato yogurt? I can’t imagine ever being that brave. 🙂 I just got some new skin care products that contain essential oils and I love them. It’s so exciting to find something new that you can’t live without. 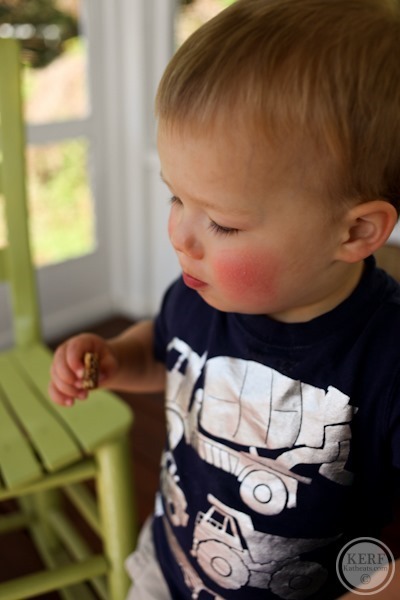 Maze and his cherry red cheeks – such a cutie! As a person who has tried finding the lowest calorie count all the time, I have been trying to switch my mindset into the lowest ingredient count! Much healthier. I love Angela’s blog and would love her cookbook! And I am ordering those Lock Laces TODAY because I hate tying my sneakers! How come I’ve never heard of those before?? I love real food! 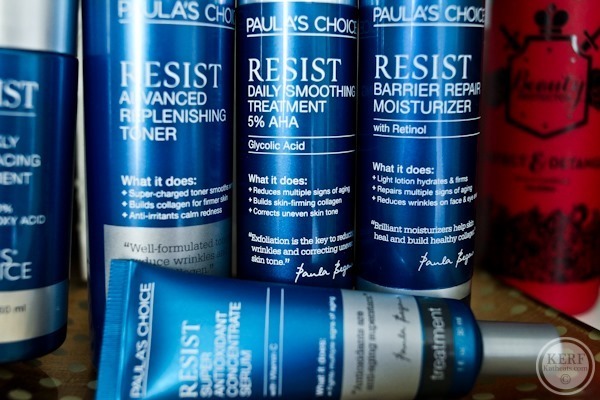 Great post Kath – can’t wait to try some of the Paula’s Choice anti-aging products! I made Angela’s 4 ingredient dark chocolate almond butter once and it was so beyond incredible… would definitely love to get my hands on this book! The beet flavor sounds the most exciting! You didn’t mention the Beauty Protector Protect & Detangle you have in the picture above! I love that stuff!! I got it in my birchbox about a year ago and immediately bought a huge bottle.. the smell is divine! Yes love it! The smell! I was coming here to comment about this too – it really does smell awesome. I haven’t noticed much of a difference in my hair, so I mainly use it just for the smell! Almonds in the shell are always prevalent at Christmas in stores. Never seen them? I am intrigued by the Paula’s Choice line. I am such a sucker for skin care. Are they environmentally friendly? I am going to look for that salsa in our WF. Ernie’s salsas look so good! 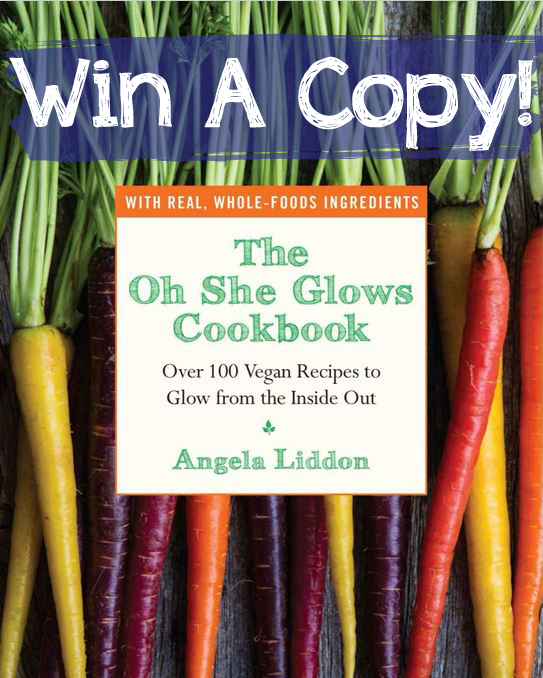 And I would love to win a copy of the Oh She Glows cookbook, from everything I’ve heard about it, it sounds amazing!! Love your blog and hope I win the cookbook… as a vegetarian all her recipes look divine! I have never heard of/seen almonds in the shell! Interesting! I’ve been adding beets to my smoothies so I’m sure they would be great in yogurt! Would love to win Angela’s cookbook! I’m a huge fan of her blog. Thanks! That salsa looks delicious – I am sure I would love the Chesapeake Shrimp! Oh, I’d have to try the chia donuts! The almonds look great, but I am loving the Lock Laces. So much easier than tying and tucking laces. The Oh She Glows cookbook looks like a beautiful book. I can’t wait to see it in person. I’ve been dying to try the Oh She Glows donut recipes as well! I just need to get my hands on a donut pan. I’ve been wanting to buy this cookbook every time I walk by it at Barnes and Noble!! I feel like I would be more likely to try beet than I would tomato yogurt! They all sound super interesting and would be a yummy in a recipe! Wow, so many amazing new products! Thanks for sharing. Goodness, so many great goodies!! I love a good salsa! Did you get that shine spray in your birch box? It recently came in mine and I love it! Yes love it and i bought the full size! Angela’s veggie burgers (on her blog) are the BEST! These look like some great finds!! Love Oh She Glows!!! I’m a fan of Angela’s blog and would love to win her cookbook! I’m going to look up the lock laces now – I haven’t heard of them and would love to get a pair. Snowville is the best! They’re local to Ohio (where I am), so I love supporting a local business. I buy their milk all the time. When I make ice cream (from the Jeni’s book), I use only their milk and cream products. Their yogurt is pricey, but delicious. There’s a cardamom & mace flavor that tastes like eggnog! It’s more a special treat yogurt than something I can stock up on. I just picked up Angela’s book from the library yesterday to flip through and see if it’s one I want to add to my collection. I’ve found a lot of vegan cookbooks to be disappointing, but hers is great! LOTS of photos and no crazy ingredients, at least none that I don’t already have. Tastes like egg nog – gotta find it! It’s turmeric and mace that tastes like eggnog. I picked some up today and I realized I’d told you wrong! The turmeric gives it a lovely yellow color. Thanks for sharing your recent new finds. It’s always fun to get ideas from your blog. You can’t go wrong with any of the Blue Hill yogurt! My family knows Dan Barber (the chef at Blue Hill) so we got to try the beet yogurt before it came out. After trying all the flavors, I can tell you the beet flavor is the BEST!! They’re all so unique and tasty! Wow I have never seen almonds like that in my life, haha! The salsas all sound delicious. Speaking of old bay-flavored things, the roll at Ten that has old bay in it is SO GOOD. Most unique sushi I’ve ever tasted!! I haven’t seen that roll but I must try it! I love your review posts! always something I want to go out and buy..now I need to find that Salsa and yogurt! big fan of Oh She Glows blog! The Oh She Glows Detox Soup is life-changing! Oh, I have to check out that salsa! I’m going to whole foods this weekend for sure! Specifically to find that creamery yogurt! Yay real food!! Thanks for sharing your new finds! I have been eyeing that cookbook, hope I win! The lock laces look amazing! Great post! So many unique finds! I am determined to find those salsas; they sound incredible. Tell me what area you live in and I’ll give you a list of stores that carry it. Awesome post and thanks for the giveaway! I love vegan recipes filled with real food. 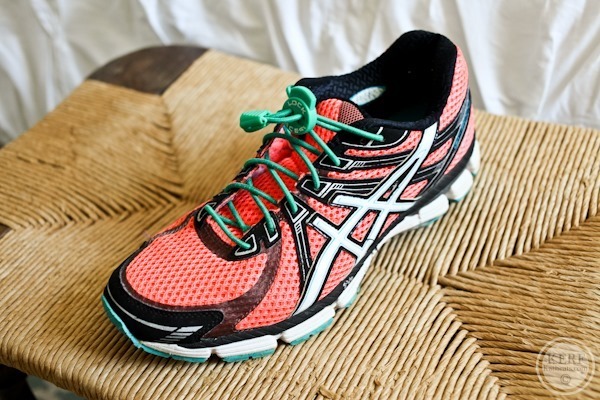 I love the colors of your running shoes — so fun! Which brand/model are they? I have been planning to purchase this cookbook for a while now! Hopefully it will give me some new ideas for meals! I’m a big fan of Oh She Glows and would looove her new cookbook!! Thanks for the great post and giveaway!! I’m always interested in new cookbooks. And I love her cover page! Haha I would be hesitant to try tomato yogurt! 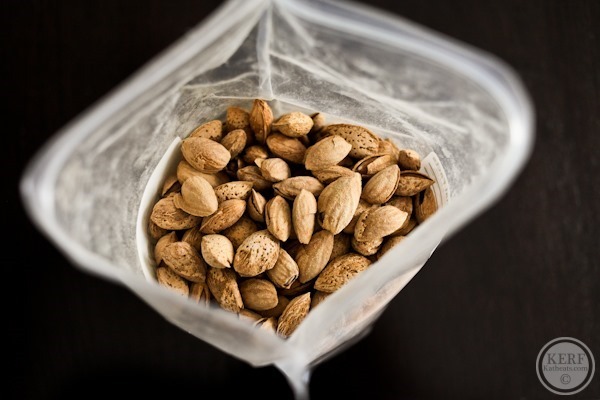 But I love the almonds in their shell idea, I’ve never actually seen almonds in their shell! Those almonds look so great! I would love to try one of the Oh She Glows Cookbook recipes! I love trying new things, especially vegan recipes, it’s incredible how amazing something with out an animal products can taste! Love almonds in the shell! Takes me longer to eat instead of just stuffing them all in my face at once. I need to try that salsa! Also the cookbook loooks amazing! Those carrots on the cookbook are amazing. My carrots are always just orange. I bought Angela’s book a few weeks ago and it is AMAZING! My favorite cookbook by far and I have an entire cabinet full of cookbooks! I love Oh She Glows. Her recipes are tried and true! I love Angela’s recipes. Her roasted tomato pesto pasta is the best. Every time I get to the Oh She Glows blog, I can kiss a couple of hours goodbye! I tried the beet yogurt – that is the only flavor I have tried from Blue Hill. I didn’t know what to expect, but I really liked it. I love beets, it was not sweet but it was nice for a change of pace. I love the idea of cracking almonds! It would make me slow down and savor them. I love her website! I also love that my husband is coming around and actually likes a lot of the things I make from her website! Go chickpeas! Love hearing about new products! Going to look for that salsa. Tell me what area you live in and I’ll give you a store list. I would love this as motivation for health! I really enjoyed this post about new finds. I have recently bought Lara Bars, so I’m interested in knowing what else is out there like them. Thanks for all the information. The Green Monster from Oh She Glows is a favorite of mine! Great products! Savory yogurt sounds like a great option for all of those dishes you dollop with plain. Your gumbos and soups and rices and such! Oh She Glows is my go-to for healthy recipes – it has been for years! Her recipes are delicious, easy, and nutrition packed that you feel great after such a good meal. What more could you ask for?! Oh She Glows seriously changed my life! I have never had a bad recipe from her and I feel like she taught me how to cook, shes so creative and I love that her vegan recipes use whole ingredients instead of using fake cheese, fake sausage etc all of the time. I started reading your blog and Angela’s at about the same time and I made a complete lifestyle change and am currently getting my masters in nutrition at GMU. So. many. great. products. The vegetable yogurt intrigues me. I’ve never really thought of yogurt as a savory snack, but I think I could get behind that. My favorite food find as of late is the corn and pepper salsa from Trader Joe’s. It just tastes like summer. I’m so entrigued by the butternut squash yogurt. I’d love to try and find it! I’ve been buying granola at the farmer’s market and am loving it! It’s made with chia seeds, flax seeds, hemp seeds, walnuts, and molasses. No oats and still so delicious! Would love to try some recipes From the Oh She Glows Cookbook! And as a salsaholic I’m going to have to look for the ones you mentioned at Whole Foods! I’m currently loving Newman’s Pineapple Salsa – another favorite is the 365 Roasted one (tho it’s a bit on the watery side). Oh She Glows is one of my favorite blogs! I’d love to win! I live in the VB area and can’t wait to try Ernie’s salsas! Angela’s cookbook looks amazing and I’ve been seeing nothing but great reviews about it. Also, that yogurt sounds so interesting, tomato yogurt? might be a good topper for savory dishes! Ooh, looks like I need to pay a trip to Whole Foods. So many fun finds! Love all the products you reviewed! The vegan cookbook looks fabulous! I’ve always wanted to check out her cookbook – I am well into my 2nd trimester & finally back to cooking & eating regularly! yay, i love ohsheglows! i’ve tried quite a few of her recipes, but would love a copy of the book. I used to use Paula’s Choice as a teenager, thanks for the reminder! I just might need to go back and check out the anti-aging lines. Thanks for the info on the grass fed yogurt. I also love Angela’s blog and would love to win her book! Ahhhh I have wanted this cookbook since before it even came out!!! And those almonds are awesome, I’ve never seen them sold in the shell either! The butternut squash yogurt looks delish! Guess I’ll have to stop by Whole Foods thiw weekend! What are you using for a daily cleanser now? I gotta check out my local WF for that bnut squash yogurt, looks super interesting! Hi Kath! Enjoyed reading about your new finds. I agree that having a skin care routine spelled out is a real help if you aren’t experienced. Real food is awesome food!! I’m a baker and love finding and utilizing as much local food as possible. That way my customers don’t just get to experience my passion, they get a taste of the love of the entire local food community and can support not only me but the local farmers as well. Those salsas look fantastic!!! I hope our local Whole Foods sells them!! These look like some great real food finds! Angela is one of my favorite bloggers!! Also, I need to get my paws on that Chesapeake salsa, yum! My friend has been raving about Oh She Glows cookbook: http://noyinkatie.wordpress.com/2014/04/24/5-firsts/ I would love to try it out! 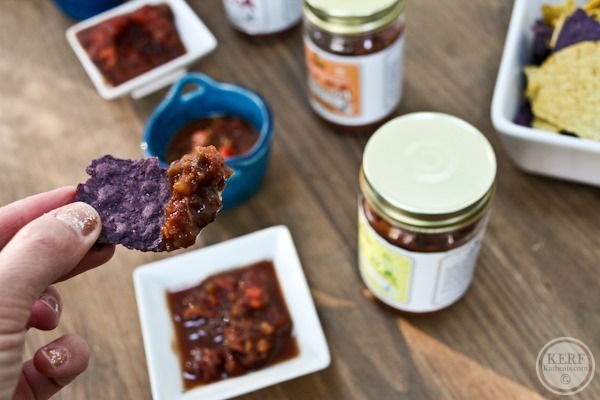 I can’t decide what I’m more excited about: Chesapeake salsa or a new vegan cookbook to try! Those raw vegan crackers look delicious! Can’t wait to check ’em out. I just heard that in another comment. Must be why her ice creams are so darn good! I am intrigued by those lock laces. I have to check these out. mmm I love peach salsa! I love these posts! Angela’s cookbook looks beautiful! Sounds like lots of cool stuff!! Love those laces!!! must try! I love Angela’s blog! I’ve never been disappointed with a recipe yet. I have been trying to add more greens to my lunches! Even when I don’t want a salad, I am trying to put whatever I am having that day over greens! A trick I learned from your food posts! Yummy, I love a good salsa! Wold love to try the cookbook, I have heard good things. I love Oh She Glows!!! As someone who is a gluten free vegan, it is so nice to find someone who create recipes that I can try! Love this post! It’s always great finding new foods! I sure hope I win the cookbook!! I don’t own a single cookbook, and have been in the market for a good one 🙂 I do love recipes i’ve found on her blog! I love real food! I’m trying to eat less processed food to see if my skin clears up. I love Snowville Creamery products. We are not a cow’s milk family, but once in a while I cook with it and always get that brand. Those yogurts sound delicious! I’m a fan of pumpkin yogurt (especially making it on my own using canned pumpkin topped with plain full-fat Greek yogurt, almonds, cinnamon, oats, chia seeds, and a dash of maple syrup), but I’m undecided how I feel about the other veggie flavors. B’nut squash and sweet potato would be the ones I’d try. My chiropractor is always telling me that I need to untie my laces before taking off my sneakers, so I’m thinking those lace locks are next on my wish list. I’ve heard so many good things about that cookbook and of course love her site. Thanks for sharing! I recently bought the Oh She Glows cookbook for a friend for her birthday and want one of my own so bad! I love Oh She Glows! LOVE Oh She Glows! Would love to win the cookbook! LOVE all these suggestions! I especially love knowing which ones are a hit with the munchkin so I can try them on mine! 😉 thanks for the yummy inspiration! Thanks for the tip on the lock laces. I ordered some for myself and my husband! 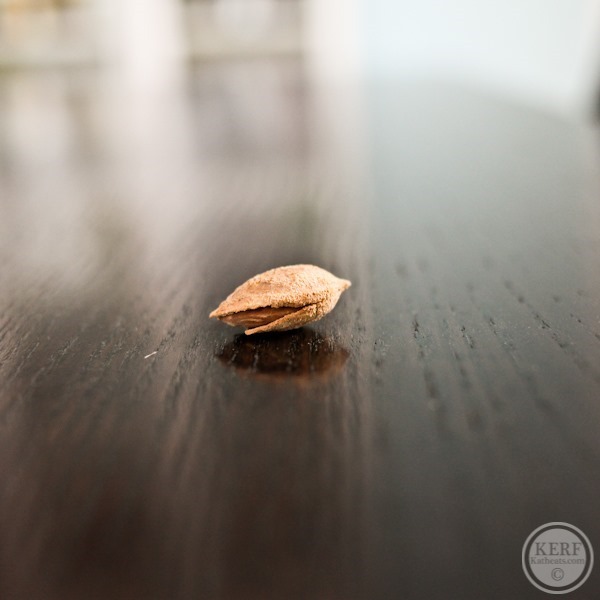 Nothing can get realer than almonds in the shell! I’d like to try that. These products are all very interesting, will try to check some out! I love Snowville Creamery products. They are localish to me, so I can enjoy supporting a local company. Butternut squash and yogurt combines two of my favorite things!! I have a son close to Mazen’s age, he is about to turn 22 months old. I cared about eating real food before I have him, but now it’s a must. It’s amazing how thinking about what your child puts into their mouth changes your perspective about what you put in your OWN mouth! The whole idea of savory yogurt freaked me out until I read the ingredients in the Butternut Squash flavor. Mmm 🙂 Thanks for sharing! That tastymakes stuff looks really interesting! I might have to check that out! And I love beets but that beet yogurt sounds a little too crazy for me! 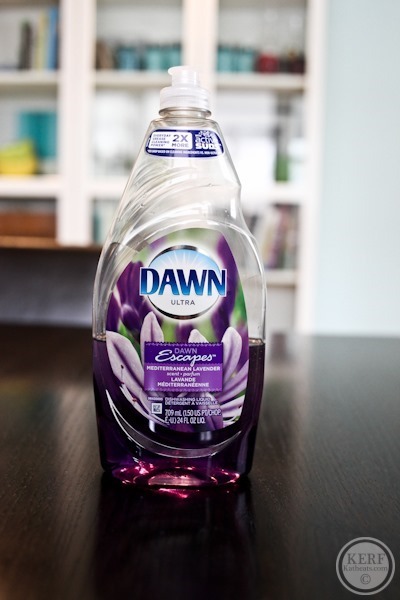 That dish soap looks like it smells amazing! Also, I love Angela’s blog and would be thrilled to win a copy of her book! I love the idea of a salsa party! I love all of Angie’s recipes and would love to use her new cookbook! I’ve been eating a whole food plant based diet for exactly 2 years now and LOVE it!!! Angela’s cookbook looks amazing…would love to own it! I’ve been plant-based for 6 years and love new recipes! I love both of your blogs! I’ve just recently turned vegan, and have been so excited for Angela’s book to come out. I am always so inspired by your “Lately” posts, and have tried CookSmarts from your recommendation! I would love to try some recipes from the “oh she glows” cookbook! Those salsa’s sound great. Will have to try them out! Those salsas look awesome! I’m definitely going to keep an eye out for them, they seem perfect for summer get togethers! I’m on a quite restrictive elimination diet right now (to see if it helps with some chronic hives) so I’d love the vegan cookbook! Gorgeous cover photo! I actually already own this cookbook and am rather obsessed! I would love to win a copy to gift to my mom as she begins he own healthy living journey! I am so enthusiastic about this giveaway!!! I love Oh She Glows!!! is the most “savory” flavor of them all. The carrot and sweet potato are a little on the sweeter side. My favorite is still the butternut squash! We ate our first garden tomato of the year yesterday and will have the first garden cuke tonight!! I am SO EXCITED for veggies from our garden!!! The cookbook looks amazing, hope I win! Several reviewed items I’d like to try if. Can find them in WA state! Those salsas sound amazing! I’m always looking for new fresh salsas! Never heard of Almonds in the shell. We eat almonds daily – am really looking forward to trying those! I love roasting sweet potatoes with cinnamon! Best combination ever! Love real food! Getting my kids to love it is a daily challenge, but I won’t give up! Looking forward to incorporating some vegan dishes in our non-vegan healthy eating style. I just started adding avocado into my green smoothies!!!!! I love Angela’s blog and would love a copy of her cookbook! Love your blog and Angela’s!! So fun to see her book here. Thanks for the new finds. I have to try the savory yogurt! I keep seeing amazing photos from this book. I’d love to win a copy! If not…birthday presents are not far away. If only she’d teach me her food photo skills along with recipes! Those yogurts look so interesting! Does the butternut squash taste like squash? I wonder what you could do with the tomato? I bet it would be good for a ravioli filling! These posts are always so fun. I love hearing about new things. The butternut squash yogurt sounds so unique! I would love to try it! So many yummy snack options you mentioned! So perfect for warm summer days that are spent outside. Love me some munchies! I’ll have to look for the savory yogurts next time I’m at whole foods! I would also love a copy of the cookbook! I have three young daughters and work hard to cultivate their love of real food. Loving all these new finds! =) Thanks so much for sharing them with us. I’ve been busy in my garden getting things planted and I can’t wait to eat fresh! We have 5 chickens and now have fresh eggs daily. We are loving growing our own produce and having our own eggs. It’s a little change that I think will definitely pay off in the end! So happy to see the Snowville Creamery shout out! I live in Columbus, OH and their milk and yogurt products are the best! And I love the company. Jeni’s Ice Cream which is from Columbus uses Snowville. Try the flavored Snowville yogurts, too!! Yum. I’ve just recently started following her blog…and have tried a couple of recipes as a result. I’d love to try some more! I’d love to win a copy of Angela’s cookbook! I’ve been reading her blog for five or six years now. I just ordered from Paula’s choice after reading your complexion post too. So far I’m pretty happy. Sorry to be a downer, but I just read that the gap is one of the companies that has been resistant to implementing safer standards in the Bangladesh factories (target & Costco clothing too). I’m trying to avoid shopping there (or BR) for the time-being. Just some food for thought in the run up to summer shopping. Great to see these new finds! I’ll be trying a few of them. I would love to check out the Oh She Glows cookbook! The real food recipes would be fantastic. I’m always looking for new whole food recipes and Oh She Glows has great recipes! I’d love to check out the book! That salsa looks amazing! I would like the cookbook to try some of the veggies we are growing this year! Oh I would love to win her cookbook. I make recipes from her blog all the time. Big fan of you and Oh She Glows!! I love oh she glows and her approach to food!! Would love to win a copy. Those salsas made my mouth water, can’t wait to buy some! The shrimp one is the one I want to try first- how unique! And next time I’m at whole foods I must pick up that butternut squash yogurt – I want. I need. Yum!! Love your blog – you always give me such great ideas! I want to come to Virginia some day on vacation and meet you! A stop at the great Harvest is also a must! Your bread looks wonderful!y boyfriend always laughs at me as I lay in bed before we go to sleep reading ally blogs- he’s like hey what’s kath up to these days lol. Paula’s Choice products are wonderful! They’re fragrance free, which is hard to find in skin care products. 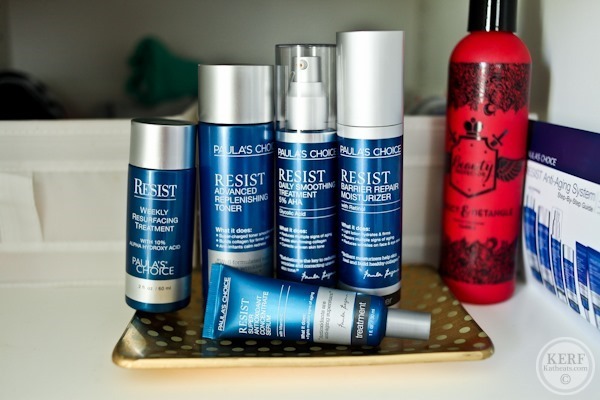 You will love the Resist daily sunscreen/moisturizer. I don’t even need to wear foundation over it because it provides light coverage. Worth every penny! I need those lock laces! Thanks for sharing! food power? I’m leaving my comfortable job in the government to start my own baking business – scary, but amazing! that’s food power. Real food is the absolute best!! I would love to try any recipe out of the Oh She Glows cookbook! And I agree, the photos look amazing! I have been dying to get her new cookbook. I love both of your blogs and have been following them for a while! Savory yogurt sounds so interesting! I will have to try it! I bet a sweet potato flavor would be great. Going to try the salsa as well, love all your finds! Thank you! So many great finds packed into one post! They have almonds in the shells at Trader Joe’s (my kids consider a few of them in their lunchbox a special treat). I must get myself and my kids some of the lock laces ASAP! Also, I need to try that yogurt soon. 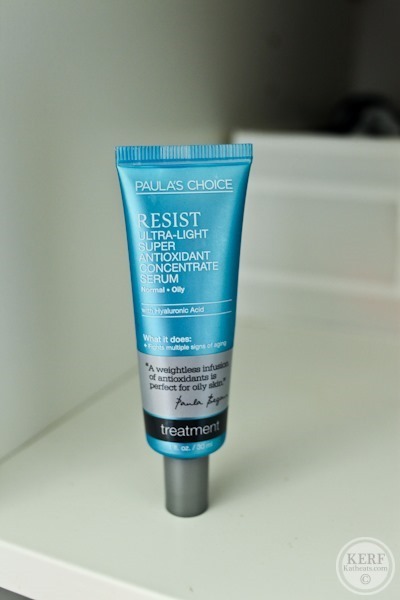 I definitely need a new skincare routine so I think I will check into Paula’s Choice, I need something fragrance-free and non irritating, at age almost 38, age and hormones are really starting to affect my skin. I love Oh She Glows recipes but there are so many more to try!! I also need to try those almonds, I am very intrigued. My stepdaughter just went vegan, and I am intrigued…. I love to cook, and am always interested in finding ways to get more ‘real food” into my diet! That cookbook looks awesome! Also, can’t wait to try those almonds! I really want to try this cookbook! She is Canadian and so am I, which is exciting in this blog world! I live in Ann Arbor, MI and the real food movement is alive and well here! I love it! Thanks for the tips, I’m enjoying trying new things. Angela’s book is great- I’d love a copy! Love Angela and her recipes and I’ve been itching to get my hands on her new cookbook. Excited to try some of these other new-to-me products, too! I read OSG too & would love a copy of her cookbook. I would absolutely love to win Angela’s cookbook. I’ve read her blog for years and all of her recipes look SO mouthwatering!! I can’t think of many books I’d rather have in paperback (vs electronic), but OSG is totally one of them. I’m glad I made it to the end of the post because I’d totally love to get this one! thanks for the awesome cookbook giveaway. the cover photo is beautiful! 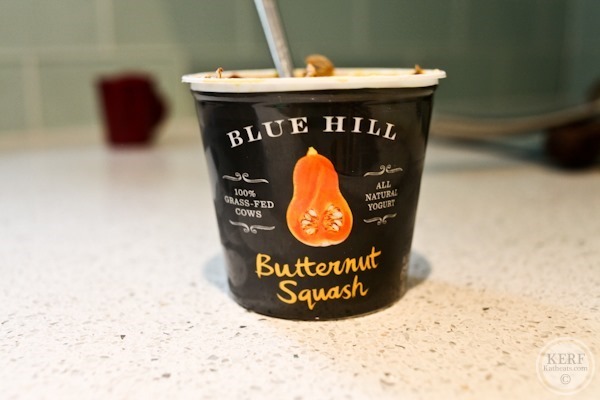 The Blue Hill yogurt looks amazing — I might have to go to Whole Foods to pick up some butternut squash! Those yoghurts look fabulous- why have I never seen savoury flavoured yoghurts before!?! I’ve been following Angela for years and would love to check out her cookbook! Lock laces? Never heard of them before. I’m always re-tying my laces, I will definitely scout these out. The Blue Hill yogurt sounds very interesting! That Paula’s Choice referral code is so good, it almost got lost in the post! $10 off $15 is amazing! I have been wanting to try the line, this gave me no reason not to! I would love to get my paws on Oh She Glows’ cookbook. I love her and her recipes! Oohhh I’ve been eyeing the oh she glows cookbook- would love to try it out!!!! Ah I would love to win a copy of Angela’s book. Her recipes are awesome and I love mixing up my meals with something different, delicious and healthy from her website! 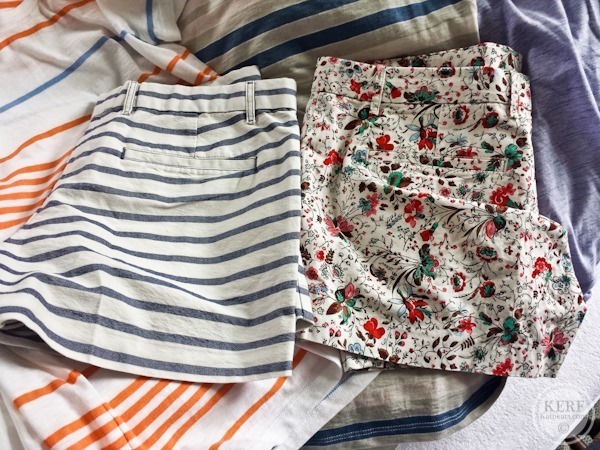 Also those Gap shorts are super cute. I’ll have to check out that Snowhill Creamery yogurt! I use 0%, 2% and full-fat yogurt for different dishes, so I’d love to check out the 6%! I’m also a huge fan of Angela’s recipes, so I can’t wait to check out her cookbook! I would love love love to win a copy of this! I have a passion for “real” food! Those TastyMakes look so amazing! I love getting new cookbooks that have recipes with real food! Peanut butter coconut granola and gluten-free tamale pie are some of my favorite latest recipes! I’m always on the lookout for new veggie-centric recipes. This cookbook looks awesome! Huge fan of Oh She Glows. We love Snowville Creamery milk in Ohio. Best milk ever! We love the yogurt too! So glad you tried it! I have been reading about Oh She Glows on various vegan websites forever! And I have made a couple of recipes, or just printed them out to try later. But Angela is a great recipe developer and her photography is great as you said. And Real Food is the best! I’ve loved Angela and Oh She Glows since the beginning. I’d love to win a copy of her cookbook!! Thanks for sharing – Angela’s recipes are one of the few that translate well from blog to real life and I’m so excited for the book. Also excited to see Snowville recognized – they sometimes have their products in my CSA in the Cleveland area and it’s so good! Considering a new skincare line. Will look into that! Kath-would love an update on the Paula’s Choice skincare. Are you still using it? Yes and still like it a lot!